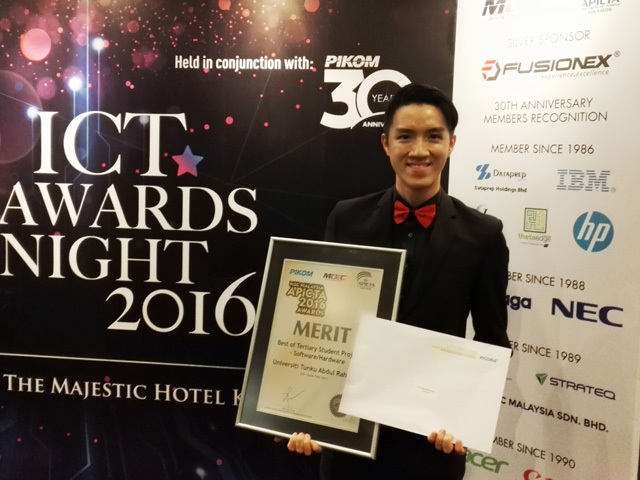 To Guide, Track and Alert, in short, GTA — that was the project that propelled Bachelor of Computer Science (Hons) alumnus Tan De Zhern to victory at the 17th MSC Malaysia APICTA Awards 2016 on 20 October 2016 at The Majestic Hotel Kuala Lumpur. Organised by The National ICT Association of Malaysia (PIKOM), the event was held to provide recognition to the outstanding achievements of individuals, students, entrepreneurs and organisations in Malaysia who have contributed to the development of MSC Malaysia initiatives. Tan certainly proved his innovation and creativity with his “GTA — Guide.Track.Alert” project that secured him the Merit Award in the Best of Tertiary Student Project — Software/Hardware category. He also walked home with RM1,000 cash for his win. The panel chairman of the category likewise commended Tan’s project and hoped to see more entries from UTAR in the coming years, especially projects like Tan’s which aimed to provide solutions for industrial, commercial, medical and social needs. 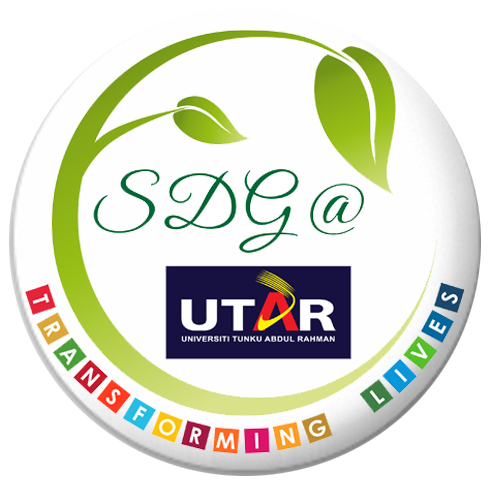 Despite being his last project representing UTAR, Tan’s GTA project was not only meaningful for him but also serves the greater good of society, especially benefitting elderly and handicapped communities. The idea was inspired by the lack of public transport catering to them, the possibility of getting lost, and their difficulty in getting help when needed. 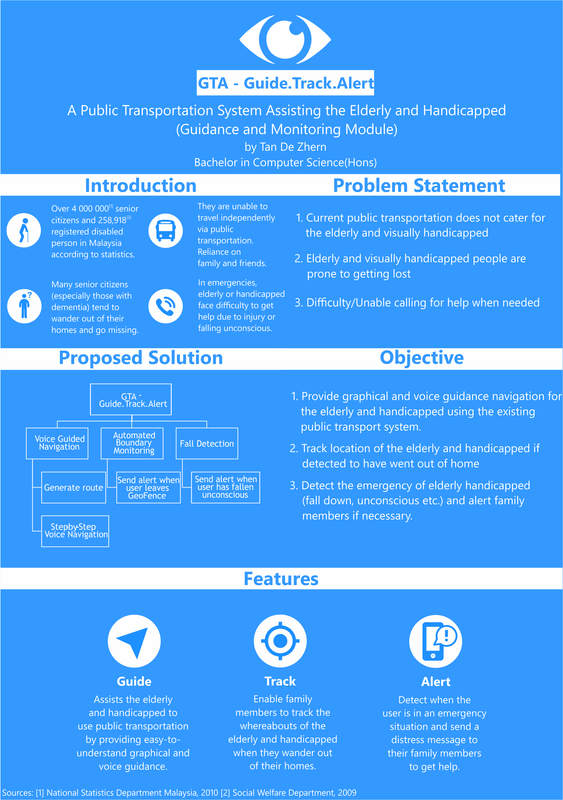 Hence, the GTA project will enable the elderly and the handicapped to travel independently while using public transportation through the user interface application that is specially designed for them. GTA functions by using a voice-enabled guidance system (guide) to provide graphical and voice navigation when using the public transport system. It uses automated boundary monitoring (track) to automatically track a user’s location to prevent them from getting lost and uses a fall detection alert (alert) to detect any mishaps faced by the user which will then alert the family members. Overall, the GTA project is expected to enable the elderly and handicapped to live more independently with the help of technology. “I positively encourage my juniors to participate in competitions because the experience and recognition they receive will be a valuable factor when they are looking for jobs,” advised Tan to his juniors. Tan, will also be one of the teams representing Malaysia to the International APICTA Awards 2016 at The Grand Hotel, Taiwan, from 2 to 5 December 2016. He continues to look forward to more future opportunities in competition as such and hopes to compete as an IT professional.